We've all seen them in grocery stores and restaurants: delectably juicy, evenly browned, picture-perfect rotisserie chickens. Do you think they look unattainable, like something that can only be bought in a store? Now you can make deliciously lean and easy to make rotisserie dishes at home! Go on; give it a whirl with recipes such as Garlic and Herb Roasted Chicken, Apricot Glazed Pork Roast, Tequila Lime Flank Steak, or Roasted Potatoes with Fennel. The Lean Rotisserie Cookbook creatively takes rotisserie cooking well beyond chicken to every kind of food and every course of the meal! 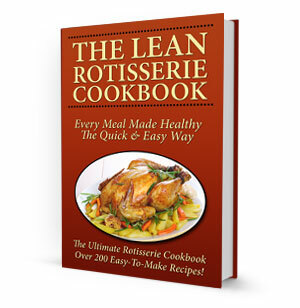 Healthy rotisserie cooking is easy with The Lean Rotisserie Cookbook. Anyone can do it - whether you consider yourself a "cook" or not.